The only bottle of 1926 Macallan featuring a hand-painted design by Irish artist Michael Dillon has broken the world record for the most expensive whisky after fetching £1.2 million (US$1.5m) at auction. Described as the “holy grail” of Scotch, the one-of-a-kind single malt has also become the first bottle of whisky to exceed a sale of £1m. The lot went under the hammer at Christie’s in London this morning (29 November). Tim Triptree MW, Christie’s international director of wine, described the sale as a “landmark moment” for the whisky market. “The results confirm the strength of the market for whisky and the continued success of Christie’s in offering the finest spirits to our collectors across the globe,” he added. 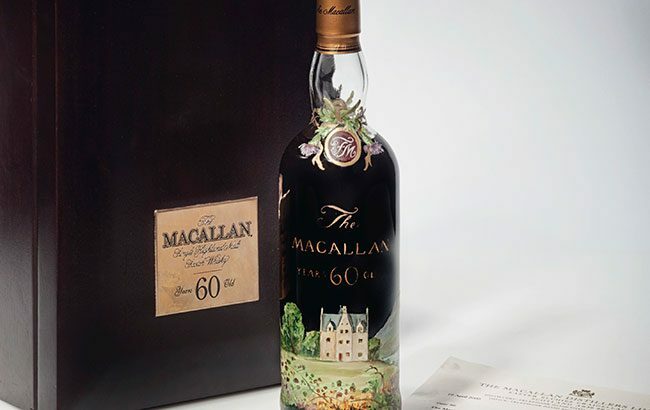 Only 40 bottles of The Macallan 1926 were released in 1986 following a 60-year maturation period in Sherry-seasoned oak casks, each with a £20,000 price tag. Twelve were given to artist Peter Blake to design, and another 12 were set aside for artist Valerio Adami, with one bottle hand-painted by Dillon. The last world record for the most expensive bottle of whisky was set by The Macallan Valerio Adami 1926 last month. The lot fetched £848,750 at a Bonhams sale in Edinburgh. Until earlier this year, the last known sale of a 1926 bottle of The Macallan was through Christie’s in 2007, which fetched US$75,000.